The participants will be blindfolded and brought in front of various artworks during the performance. For each artwork we will select a different human sense to focus on (hearing, touch, smell). After the exercise focusing the sense(s) the participants will be asked to remove their blindfold and take a small card from ourselves to write their first impression(s)/thoughts/emotions toward the artwork (if it triggers a memory then they can write this down also). After each artwork the participant’s opinions will be collected in a separate box for each sense as form of documentation. After the performance with participants we could exhibit the cards around each art work for other visitors in the museum to view. We plan on playing 4 recording of different sounds (silence of the museum, hunters talking and gun shot, Africa sounds [wildlife] and elephants in pain). Each audience member will only hear one of the four sounds at a time, we will then ask them to remove the blindfold and view the tusk. After which we will ask them to write their first impression of the artwork on the card, we will then place the cards in a box as a form of documentation. For this sense the performance process will be repeated four time so all of the participants hear each sound. Relevance/ Relation to setting– We often go to the museum to observe artwork and artefacts, so by taking away the participant’s sight we are asking them to focus more on their other senses in order to convey an alternative perspective. Marina Abromovic – influenced our curiosity of using the human body as a focus in a performance. Blast Theory – Using conventions from their performances, for example Ghostwriter by making the participants hear another opinion/story which may shape the way the originally portrayed a piece of art. 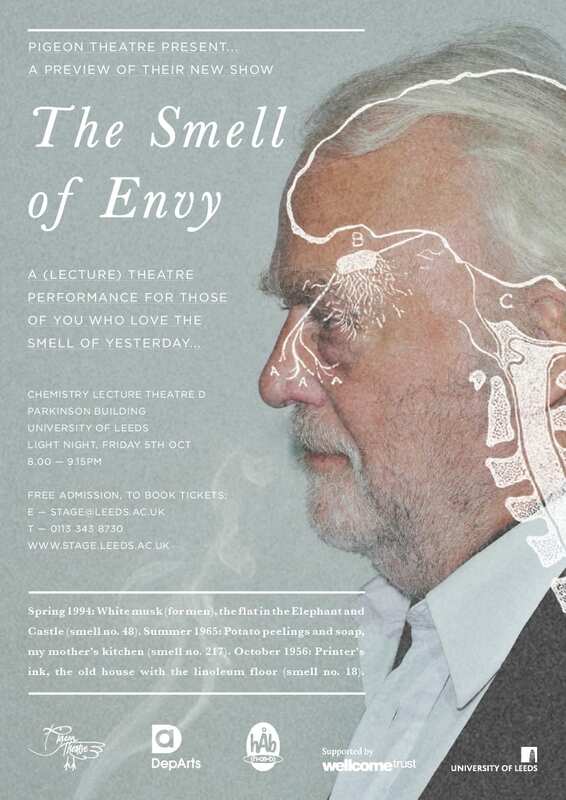 Pigeon Theatre- Inspired by The Smell of Envy, using the idea of smell to create original thoughts in response to a subject.